• 1171 sqft , 2 bath , 1 half bath , 3 bdrm 2 story – FOR SALE CAD369,900 . 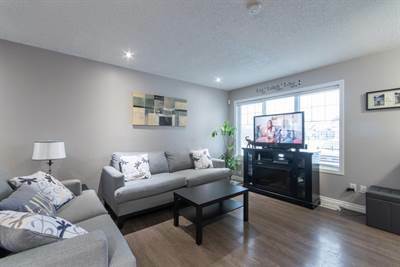 Are you looking for a terrific home in a great neighbourhood? Look no further! This gorgeous 3 bedroom, 2.5 bathroom home has been lovingly updated giving you a move-in ready home you’re sure to love. It features a terrific open concept floor plan that utilizes the space so it feels like a larger home. The main floor living is open concept and has a large living room with pot lighting, and it opens to your ample kitchen with corner pantry with the dining room at the back. Upstairs you will enjoy the spacious master bedroom with walk in closet and ensuite and a second bedroom and full main bathroom. In the basement is the freshly complete 3rd bedroom, family room and a partially complete full bathroom as well as the utility/laundry room. The back yard of this home has been landscaped and leads to a poured concrete garage pad — the biggest single expense when it comes to building a garage and its already complete! Check it out today!